Antibacterial, stimulating and revitalising. Belonging to the same botanical family as carrot, celery and parsley, Coriander essential oil is obtained from either the seeds or leaves of the herb. In aromatherapy, the essential oil derived from the seeds is preferred due to its superior therapeutic qualities. It has a sweet, woody-spicy aroma that is uplifting to the spirits. 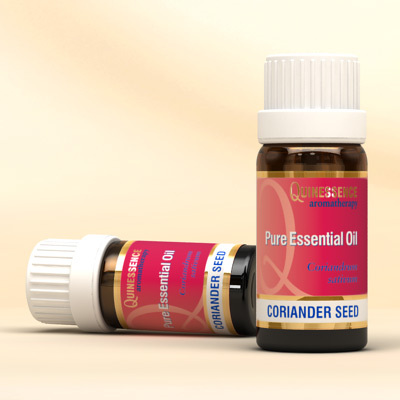 Coriander Seed essential oil has a revitalizing action that helps with the elimination of toxins by stimulating a sluggish circulatory system, plus it can re-energize flagging energy levels. When used in skin care, its recently-discovered antioxidant qualities* help to neutralize free radicals and rejuvenate skin cell production. Like most spice oils, coriander can stimulate a poor appetite and ease digestive disorders when used in massage blends. Some aromatherapists have found Coriander Seed oil helpful in cases of anorexia nervosa. Coriander Seed essential oil has a sweet, woody-spicy aroma that has a calming effect on the mind that helps ease stress, and is also said to promote creativity.